Using the Dome Calculator to help work out strut lengths and angles is great but there’s nothing like working from real scale drawings. 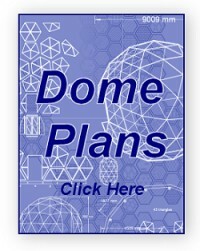 These plans are for a basic 3-frequency geodesic dome about 7 meters in diameter. No door or window openings have been included but the spacer panels that make the dome base flat have been. This dome is constructed using triangle panels that are made from a timber stud frame with plywood insert (or glass if you’re making a window panel). The dihedral angle for each panel is 166 degrees except were hexagon panels meet pentagon panels (marked B on above drawing), which is 168 degrees. There are two different angles to cut timber studs, to make things a bit simpler I’ve adjusted the B strut angles so they only need to be fitted to the base of the triangles that make up the pentagon panels (Y panels) the struts have a rebate cut to accept either glass or plywood infill, plywood could be nailed straight to the stud without the need for a rebate but would require dihedral angle to be cut on all sides. Rebated stud enables the use of square edge infill triangles. The B on the base of the Y panel shows were to use B struts (all other struts are A). Z panels don’t have any plywood infill they can be made from (A) struts cut into a wedge from 58mm to nothing. A brace section of stud can be fitted on the centreline of each panel; this strengthens the frame and makes it possible to use plywood infill sheets that are half the normal size (great for using up off-cuts). All of the panels can be cut efficiently from standard 8x4 sheet material. Hi Paul It may be better to draw the end profiles of the struts (A+B) as parallograms with the long side horizontal on the page. Effectively the top and bottom of the timber are machined to form a parallelogram. As the drawings appear to show right angled corners on the left side, some readers may try to cut the timber that way ;) To visualise it, rotate the A+B strut end drawings 90 degrees clockwise. The "A" strut will have a 7 degree "lean" to the left at both ends, the "B" will have a 5 degree "lean"
One other thing Colin, when you make up the frames end cuts using my strut section will be at 90 degrees, Would you need a compound mitre for your section? Hi Paul You shouldn`t need a compound angle as the timber will sit on the bed of the saw at an angle (cut vertically). From a strength point of view the triangles are best made up in the format of your last triangle picture (bottom right). The ends of the timber will need a compound angle :) With the other method you won`t have much material to fix into and the acute angles may be a problem depending on the saw used, miter saws can usually cut +/-45 degrees. I have a miserable cold atm so its hard to visualise stuff in the minds eye so i could be off on a tangent hehe. when i get a minute i`ll make up a couple of triangles using both methods. 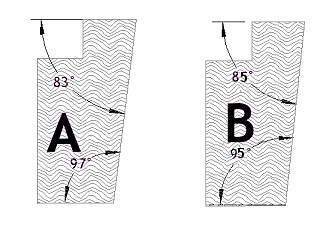 Hey Guys, I understand the drywall etc attachment need for the interior strut edge to be cut at the 97 degree angle. But it occurs to be that the outer edge can be left at 90 degrees and then the 7 degree rabbit can be added by a common dovetail router bit (about 20 dollars at rockler.com/product.cfm?page=18707). To show this on the second A-strut drawing just draw a line straight down from the right edge of the rabbit connecting at 90 degrees to the bottom strut face. Advantages: less cutting, slightly longer strut extension into the dome interior, really easy rabbiting. Disadvantages: instead of where you show one 166 degree angle in the outside skin, there would be two 173 angles, one each at the edge of the rabbits, it would be like camfering the joints between the panels. Hi Anthony, the strut length is from vertex to vertex, that's the very tip of the triangle so you would need to allow for the thickness of wood unless you do a mitre joint like the top of the left triangle. Just set the spidle fence at the same angles as the mitre. This will work on the left method above, not sure how to do it with the right method though. the sum of the interior angles of a triangle is 180 degrees. In the figure above you have 61+61+59 which gives 181 degrees. maybe 60.5 + 60.5 + 59? Your quite right roger, Here's the exact angles, I round most of the angles and measurements on the site because machining to higher accuracy than say 0.5mm or 0.5 degrees is not really possible on the average DIY saw bench. 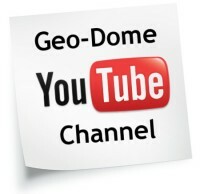 what will be the Z panel dimensions for 6m diameter dome. What are the Z panels used for. I do not see any description of where or why to use them? Love this site. A lot of really good information. 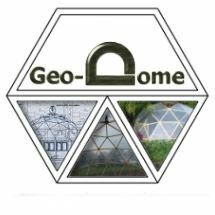 My question has to do with accessories for using the dome for a greenhouse. How are you venting the dome. All of your joints appear to be fixed. I need to vent in the summer and be able to heat in the winter at my location. I can get 3 feet or more snow and it can get to 100 degrees in the summer.